UPTET UPRI 2014 (Upper Primary Level, Class 6 to 8) was the third UPTET Examination after UPTET 2011 & UPTET 2013. Over 7.78 Lakh candidates had appeared in the UPTET Examination 2014 edition, only 188726 candidates were lucky to qualified for the UPTET 2013-14. The result for UPTET 2014 has been declared on 24 May 2014 at the official UPTET website (upbasiceduboard.gov.in). According to an official notification released by Nina Shrivastav (Examination Regulatory Authority), there are total 57506 (39.5%) qualified candidates in the PRI-2013-14 (primary, class 1 to 5) level and 94566 (18.2%) qualified candidates in the UPRI-2013-14 (upper primary, class 6 to 8) level. Today, we are here with the Original / fully Solved UPTET UPRI-2013-14 previous year question paper (SET-X) in English and Hindi, packed with the official UPTET-2013-14 answer keys / solutions for all the SETS of UPTET UPRI-2013-14 in PDF format. To tell you the truth, there are very rare / little chance of any previous year UPTET exam’s question to get repeated in the current / future UPTET examination, still the current / present UPTET Exam candidates can include this solved UPTET 2013-14 Upper Primary level question paper (SET-X) to the UPTET Study Material and can utilise this UPTET solved paper as UPTET Sample Papers / Model Test Papers / Practice SETS. In addition, by going through with the UPTET 2013-14 UPRI level question paper, the current UPTET candidates can experience the real feel of the UPTET examination, with the idea of UPTET exam pattern and the level of questions asked in the Official UPTET Examination. 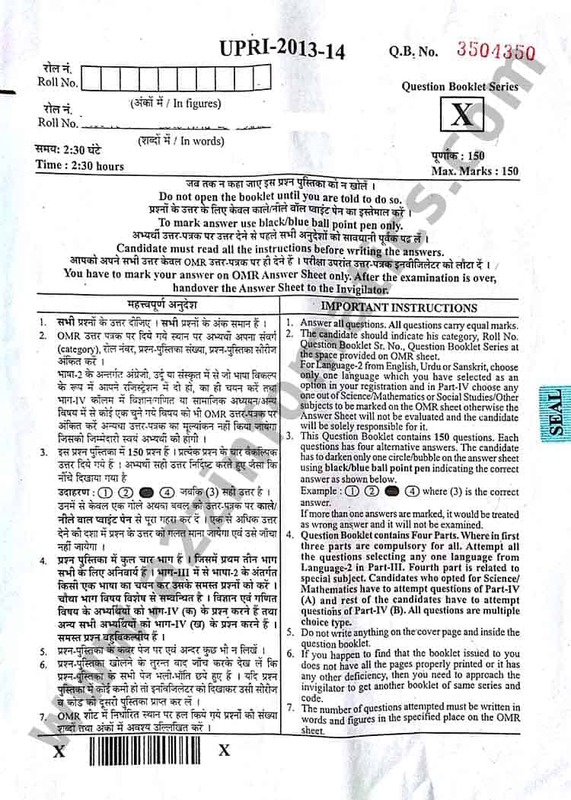 UPTET 2013-14 UPRI Question Paper 2. Important: UPTET 2014 (PRI & UPRI) is also named as UPTET 2013-14 as the online application / registration process of this edition of the UPTET Examination started in the month of December 2013, and the official examination was held on 22 February 2014 (Upper Primary Level) and 23 February 2014 (Primary Level). Download UPTET UPRI-2013-14 (Upper Primary Level, Paper-2, Class 1 to 5) Original / Solved Question Paper SET-X in English / Hindi / PDF Format. Important Information / Stats about UPTET 2013-14 – PRI & UPRI Examination (Held on 22 & 23 February 2014). Total UPTET 2013-14 (PRI & UPRI) Applicants: 8,05,245. Total Rejected Applicants by the UPTET Exam Authority: 26,438. Total Candidates Appeared in the UPTET 2013-14 Exam: 7,78,807. Total UPTET 2013-14 Primary Level (Paper-1) Candidates: 1,45,319. Total Qualified Candidates in the Primary Level (PRI, Paper-1): 57,506 (39.57%). Total UPTET 2013-14 Upper Primary Level (Paper-2) Candidates: 5,19,219. Total Qualified Candidates in the Upper Primary Level (UPRI, Paper-2): 94,566 (18.21%). UP TET 2013-14 Official Answer Key Release Date: 3 March 2014 (12 Pm). UP TET 2013-14 Official Final Answer Key Release Date: 23 March 2014 (12 Pm). UPTET 2013-14 Result Date: 24 May 2014. Students planning to attempt the upcoming UPTET Examination. All UPTET previous year solved question papers in English / Hindi are actually more than useful to estimate UPTET exam pattern, and can easily fit into the UPTET study material as the solved practice SETS. Organisations / Institutions involved in the UPTET Preparation Courses or other state TET competition exams can use these UPTET previous year solved question papers as model / sample / practice papers for their students. Candidates preparing for different related competition examinations including other state TET (teacher eligibility test), nobody can over rule the possibility of the repetition of some question asked in the UPTET 2013-14 upper primary level question paper in any other TET competition exam. Download Original / Official UPTET 2013-14 Paper-2 (Upper Primary Level, class 6 to 8) SET X Solved Question Paper PDF with Answer Keys / Solutions in English & Hindi. The original / official UPTET 2013-14 Question Paper SET-X consist of total 32 (thirty-two) pages. The UPTET 2013-14 UPRI question paper has been divided into 4 Sections with the sub-parts. The download link for the UPTET 2013-14 UPRI Previous Year Solved question papers in PDF format will be updated very shortly. Don’t forget to read all important instructions & UPTET Important / Required Documents at Examination Hall / Center, prior to attempt the UPTET (Uttar Pradesh Teacher Eligibility Test) official exam. Sections of the UPTET 2013-14 Upper Primary Level (UPRI, class 6 to 8, Paper-2, Set B) Previous Year Solved Question Paper. Part 1 (30 Marks): Child Development and Cognition / बाल विकास एवं अभिज्ञान. Note: Part number / भाग संख्या 1 & 2 are mandatory to attempt for all the candidates. There is a choice between the the sub-parts 3 (A), (B) and (C), the candidates only need to attempt any 1 out of the three. For better understanding, the UPTET exam candidates have to attempt Part number / भाग संख्या 1,2, 3(A) or 3(B) or 3(C), 4(A) or 4(B). Part 4 (A) is only for the SCIENCE stream applicants and the ARTS stream UPTET applicants only need to attempt Part 4 (B). Download Original / Official UPTET 2013-14 Primary Level (PRI, Paper-1, class 1-5) SET-P Question Paper in Hindi / English / PDF Format with Answer Keys / Solutions. Download UPTET 2013-14 Primary Level Solved Question Paper in English / Hindi. Download UPTET 2013-14 Official Answer Keys / Sheets for all SETS of PRI (Paper-1) & UPRI (Paper-2). Download UPTET 2013-14 (PRI & UPRI) Official Final Answer Keys in PDF Format. Note: The UPTET 2013-14 final answer sheets has been released on 23-03-2014 at UPTET official website. Download UPTET 2013-14 Previous Year UPRI Paper-2 (Upper Primary Level, class 6 to 8) Question Booklet Series X. Important: The UPTET 2013-14 Official / Original Question Paper SET-X consist of 32 pages, link to all 32 pages is given at bottom of this post. You are now at page number 1 of UPTET 2013-14 Upper Primary Level (UPRI, Paper-2) Solved Question Paper SET-X in Hindi / English, don’t forget to visit all other pages (links given at bottom) of this post to download UPTET 2013-14 UPRI Paper-2 in PDF format. The UPTET 2013-14 UPRI (Paper-2) exam was held on 22 February 2014 all across the State of UP (Uttar Pradesh). Note: You can use Right Click > Save Image as … > Save option to download UPTET 2013-14 Official UPRI Question Paper 2 (primary level) in Hindi and English.